There was a lot of skip in Blossom’s step as she made her way down to the ring, slapping hands as her music played over it all. She was in a good mood. She was always in a good mood when she was about to wrestle, but today she was brighter than ever. Yeah. Yes. She needed some good wrestling to clear her mind. And, lucky her, management was able to oblige, getting her setup for a house show match on rather short notice. The crowd was smaller, the cameras weren’t rolling, but that was good. Less pressure. Small and intimate. And she wouldn’t have to worry about Death Bunny getting too worried about it. Not that she was trying to keep secrets, but, well...there was nothing wrong with some Me-Time, right? Huh. Who was her opponent, again? She’d been so happy to just have a match that she hadn’t paid any attention to the playbill. She didn’t want to be too worried, she just hoped they hadn’t set her up with some psychopath. They had the worst habit of doing stuff like that when she first started out. ...and when you are called for a match, it's for a house show with a woman with very little wins to her name. A short while after dressing into her usual black sports bra, green skirt and red boots, a female crewworker told Navi she was due in 1 minute. Quickly putting on her red flower vest, she would make her way towards the gorilla position. ...and, exactly a minute from when she was told she was due, her music started playing in the venue housing several hundred people, and she appeared from behind the curtain, with the announcer stating her name, height and weight to tonight's audience. With an American fan, clearly dressed for vacation in Japan, would try and lean his body over the barricade, as if trying to get Navi to notice his hand over any other. Navi would instead simply lift her left hand close to the fan's face, with her middle finger quickly pointing up into the air with a loud and clear message for him...which had garnered a bit more negativity from his friends nearby. The French blonde would just continue her way towards the ring, quickly rolling into it for a quick gun show pose for the crowd, before her music died down, and she took her place at a corner pointed at by the referee. "Just try and survive for at least 3 minutes of the match, honey." Blossom perked up when the music hit, pouring out over the crowd with a wicked guitar riff, and a smile crossed her face as her worries vanished in an instant. She knew that tune. Heard it before, quite a few times, and she fully recognized who it belonged to and who’d be heading out. Navi Florges, come on down. Unfortunately, it didn’t seem like Navi felt the same way. That was the impression Blossom got at least, as she came down to the ring with this blatant look of disdain in her eyes, like she could make a laundry list of places she would rather be. If Blossom had any doubts on that, the blonde corrected them with the first words that came out of her mouth. Blossom just stared back, blinked, not really sure how to take it for a moment. ‘Honey’. That was a new one. ”I, uh…” She threw Navi a hesitant thumbs up. ”Three minutes. I’ll try.” No real point in arguing about it, was there? Best to just let her believe what she believed, until she couldn’t believe it anymore. The match would be underway! The two women would circle the ring, and slowly close the distance between one another. The blonde was hearing clashing chants of: "LET'S GO BLOSSOM!" and "LET'S GO NAVI! "...and hearing that the side supporting her wasn't as loud as Blossom's fanbase...smirking, she knew how to change that in a heartbeat. Outstretching her left hand, Navi would motion Blossom to come at her, challenging the girl to a Test of Strength! Blossom hopped from foot to foot as she hyped herself up, getting nice and ready for the match. House show or not, it was always good to be back in the ring, to have the lights on her, to be doing this. As much as she loved watching Death Bunny wrestle, she needed to get her own feet wet, and this was the perfect low-stress environment to do it. She sprang into her stance the moment the bell rang, keeping her profile low, her feet spaced out, her upper body leaned and her eyes forward. The two of them circled, keeping pace, speeding up and correcting. Didn’t seem like much, but it was time for Blossom to get a better idea of who she was dealing with, here - just at a glance, the blonde had her wrestling chops. Soooooooo many wrestlers in the AFW liked to just power ahead when the bell rang. This one took her time. A good start to things. She moved in, cautious at first, and locked fingers with Navi. Once they were laced, she’d start to pour on the pressure and spread her legs, ensuring she had the best base to work from as she pushed forward. Even if Navi was slightly peeved off about being at a house show, and even if her opponent seemed weak, she didn't want to just rush in, guns blazing without a plan. Who knew, maybe for these girls, that's all they needed to get a win, for someone to rush at them like a bull. ...who would do the same, circling the ring with Navi, before the blonde stepped out for a Test of Strength with the slightly smaller brunette, grabbing her arms and locking fingers before pushing onto her foe's frame with all her strength. ...she was actually forcing the blonde to start taking a few steps backwards! Navi attempted to push at Blossom with even more power...but the tiny powerhouse that was the smaller brunette was pulling through, managing to push Navi closer and closer to the ropes by the second! "...Plan B", she would think. If strength didn't work, then strikes sure would! Giving up a bit of strength to step further back (leaving just a meter between her back and the ropes behind her), Navi would attempt one good push in the grappling contest to lift her leg up, and ram it straight into Blossom's gut! Blossom couldn’t keep a smile from crossing her face - a short, meek one - as she managed to get some results and force Navi backwards. To the blonde’s credit, she was far from any definition of weak, giving her some real resistance, making the push forward a real challenge. But strength was on her side. The lower center of gravity actually worked in Blossom’s favor, making it a bit awkward for taller women to push her back. When she brought her foot down and pushed forward, there were only a few things that could really stop her, and it didn’t seem like Navi was on that list. They moved closer to the ropes as the crowd rallied behind Blossom, pumping up her underdog status. With only a little ways to go, she was sure she could get Navi up on the ropes, then send her flying with a belly-to-belly, kicking things off in her favor. Unfortunately, the only ‘kick’ going on was the one that slammed into her stomach and drove the wind from her chest, as Navi used some deft positioning to bring some pain and land the first strike of the match. While it didn’t lack for force, the surprise of it was what really took Blossom for a loop, and she wound up stumbling away while she gathered her bearings. "Oooof...you have quite the strength, I'll give you that...", Navi would compliment Blossom. Alright, she might've had something to her after all...but she still felt it was unlikely the match would last very long. 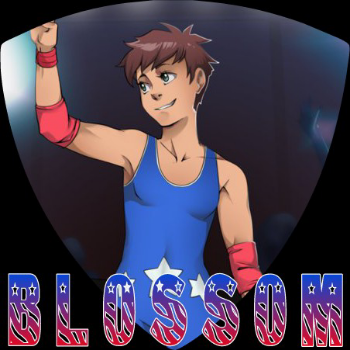 Case and point, she managed to drive Blossom away with a kick, and she would quickly attempt to follow up on that, quickly stepping towards the girl as she attempted to catch her in a front facelock, and grabbing a handful of her singlet as she tried to lift the woman up for the Vertical Suplex! Blossom was still reeling and sucking in air when Navi gave her faint praise, and she would’ve replied with her thanks if she’d had the wind for it. Unfortunately, her opponent’s blow left her wheezing, made it to hard to speak, and too hard to stop was what coming her way next. In came Navi, with open arms. Blossom was caught in those open arms, tucked tight under the shoulder, and it seemed like the next logical move after that would be to lift her up for….something? A vertical suplex, maybe a snap suplex, maybe one of the many flavors of DDT. 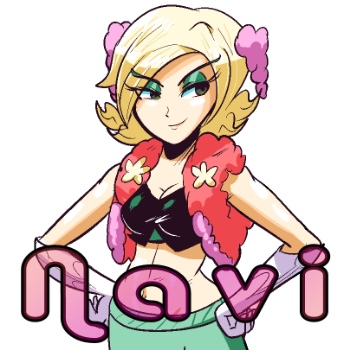 Navi wasn’t poorly built herself, she could tell the blonde could pull off all sorts of things if she wanted. Blossom didn’t know what Navi was going for, and she didn’t much care to know. Instead, she tried to hook her leg around Navi’s calf, hoping to stop whatever she was going for in its tracks and buy her some time. At the same time, she did something she rarely did: strike. To be specific, she threw a couple of quick punches into Navi’s stomach, hoping it would be enough incentive to make her back up. Her suplex was completely countered, and Blossom would further take the winds out of her sail with hard punches to her gut! Navi shoved Blossom away, but didn't want to give the girl any chance to attack her. Out of desperation, she rushed with a wild clothesline at the brunette, barely caring whether it landed or not!